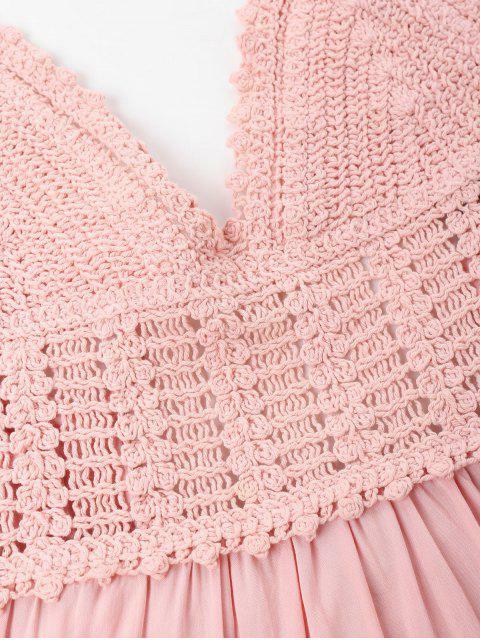 [32% OFF] 2019 Crochet Panel Cami Flare Dress In PIG PINK | ZAFUL .. It is the true size! it is comfortable and very cute! Also its material it's fantastic. I love it! THIS DRESS IS SOOOO CUTE!!! The material is sooo soft and stretchy!! It’s a little bit short tho but I’m kinda tall for my age so that prob why. This dress is obvi meant for girls with a bigger bust bc it shows a little side. And it’s not see through so that’s good. I would totally recommend!! The perfect dress for your summer adventures is here! Patched with delicate crochet and trimmed with ruffles, this mini cami dress with a flared silhouette emphasizes a flattering high waistline and pretty knotted back detail. It looks best when paired with sandals to walk on the beach for a relaxing day.